I live alone with my preschooler in an off-grid cabin on a remote island off the coast of British Columbia. I'm almost there. I am in Salisbury, NB. It's only a 3 or 4 hour drive and I will be home- if I don't get lost again. 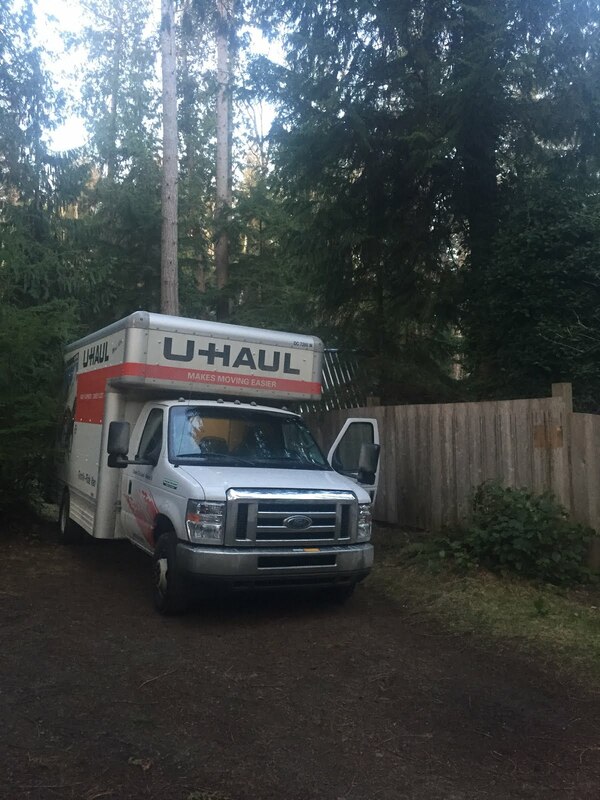 The drive across Canada from coast to coast will have taken me 10 days in this 15' U-Haul truck. The most amusing and irritating thing that has happened is that my daughter and I have been constantly covered in dog hair. The lint brush is somewhere in the back of the truck. There were numerous intense moments. My daughter who was wearing her seatbelt opened the locked truck door (yes- the door's open from the inside when locked) while I was driving in traffic entering the city of Regina, Saskatchewan. Did the wind blow it shut or was it an angel's hand? Other day's there were terrific wind gusts that threatened to pull us off the road. Another intense moment was when a ferry worker on the horseshoe ferry directed my lane off the boat. Suddenly I realized that if I didn't stop NOW my mirror was going to scrape the car next to me. I got lost in Petersburg, Ontario and Montreal, Quebec. Both times I immediately began praying. I was driving randomly, turning, uncertain where to go. My prayers were answered when I saw signs directing me to the highway/freeway I needed just as I was beginning to feel claustrophobic- which meant it was quick. There was mental fatigue and times I wanted to fall asleep at the wheel. I also discovered I needed a stronger prescription in my glasses. I limited my night driving as much as possible and every night I was directed to a safe harbour. I have never driven a truck like this before, never drove so much before and I was doing something beyond my own comfort and capabilities and the Lord provided every single time. Every prayer was answered. In my time of need He was there. I have a thankful heart. "For He will deliver him who has no helper." Psalm 72:12 Yes- I have left my cabin behind but I know God is here on the east coast with me because of all the answered prayers. I do not understand His love, His care and why I matter to Him. How can God love me because of my flaws when my partner cannot? I will leave you with a picture of the truck parked outside of my gate the morning we left the cabin and the island we called home on the west coast to begin this fantastic journey to the east coast. A special thank you to each person for every single prayer.
" I got lost in Petersburg, Ontario and Montreal, Quebec. Both times I immediately began praying. I was driving randomly, turning, uncertain where to go. My prayers were answered..."
I'm always amazed by your seemingly endless creative talents, so I'm not shocked that you've displayed such competence and grace under pressure on your long journey. Your faith is strong and I'm certain it carried you the rest of the way...Can't wait for your next post. Be safe. This is a huge move for you! Just came by today for a visit and was shocked at the changes you have made in a short amount of time, but oh how marvelous at the Lord's provision! Rejoicing with you for His care as you traveled all those miles. You are moving to my homeland! I haven't lived there for 25 years and I know a lot has changed. I will look forward to hearing about it through your eyes! Praying for you sweet friend!!! !